Playing music is a great socializer and community builder. You can experience a lifetime of friends, family connections, as well as great satisfaction by learning an instrument and playing and singing with others. You can do it in big groups, small groups or alone. You can do it at many different levels and to simply have fun. What matters is that you do it. I teach a wide array of levels and styles. You'll learn solid musical skills and good musicianship which will serve you throughout your musical endeavors. For beginners through experienced players I teach instrument-specific techniques using level- appropriate materials. I teach in a goal-oriented, personalized way using charts, music/tablature, lesson recordings and by ear. I truly enjoy teaching the instruments that I love playing. Please click on the page of the instrument that you are interested in learning to play or to improve your playing! Fiddle, guitar or mandolin - all wonderful instruments to enrich your a life. I offer an adult band workshop as a vehicle for players who want to use their skills to play and sing in a focused group. It is challenging and a lot of fun. 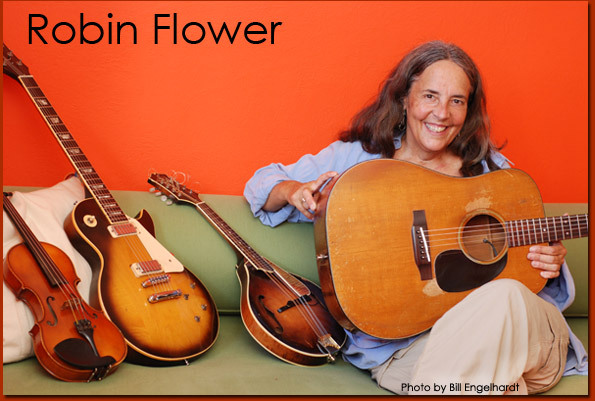 Please go to the menu and click on Robin Flower's SwingStringBand for more info. I am a very experience teacher for children -patient, warm, encouraging and engaging. I also really enjoy teaching teenagers. Please click on my children's guitar, fiddle, and mandolin pages for more info. Be sure to go to flowerandmclaren.com to see what I do with my musical life as a professional performing and recording artist.